Inside the retail box of the Samsung Captivate Glide, you will find a charger, a USB cable, and a couple of booklets. There are no headphones or microSD card in the bundle. The omission of headphones, memory card, or both, as in this particular case, has been occurring a lot lately. We don’t believe that a device from the price category of the Captivate Glide should have these essential accessories omitted. When it comes to its Android lineup in the United States, Samsung is not particularly bold in terms of design. The Captivate Glide is no exception from the trend – it is unmistakably a member of the aforementioned family. The same rule applies for the device’s build quality. High quality plastic is the predominant material at play here, while the front has seen the Corning Gorilla Glass treatment. While we ourselves would have preferred a metal-clad body for the phone, we can’t help but appreciate the weight advantage of the plastic construction. The Samsung Captivate Glide measures are 124 x 64 x 13 mm, and its weight tips the scale at 147 grams. This is quite a commendable achievement –the closest competitor of the Captivate Glide in terms of weight is 20 grams heavier. The smartphone is available only in an all black color scheme – hardly a surprise given its business aspirations. The 4” Super AMOLED Plus screen of the Samsung Captivate Glide is packing the usual WVGA resolution. Its compact (compared to the other Samsung made droids) size allows for a decent pixel density and, thus, nice and sharp content display. We are sure that we have also mentioned to you the superb contrast levels and viewing angles of this particular Samsung unit – it is still better than most of the competition offerings despite its considerable age. Below the screen are the usual suspects – four touch sensitive buttons like in all the high-end Android offerings from Samsung. Above the screen are the ambient light and proximity sensors, the earpiece, as well as the front-facing camera unit. On the left side of the Samsung Captivate Glide, you will find the volume rocker. The power/lock key is on the right. We hope that, by now, you have gotten used to not seeing a dedicated camera button on your Samsung made Android device. The slide-out QWERTY opening mechanism is located on the right side of the device. The keyboard itself is one of the most comfortable examples we have encountered in quite some time. Its four rows of key are perfectly spaced out and nicely illuminated. The four main buttons for controlling the OS are at hand, as well as arrow buttons – you can operate the device without even touching the screen if you want to. The buttons themselves feel pleasantly firm when pressed. With a metal bezel surrounding them, they are nice to look at as well. On top of the Samsung Captivate Glide, you will find the 3.5mm audio jack, as well as the microUSB port slot, which is protected by a sliding cover. On the bottom of the device is where the mouthpiece resides. It is tucked into the tiny battery cover latch. The 8MP shooter and its LED flash are located on the back of the device. The loudspeaker is keeping them company. There are no surprises under the battery cover of the Samsung Captivate Glide. Both the SIM and microSD cards are hot-swappable. 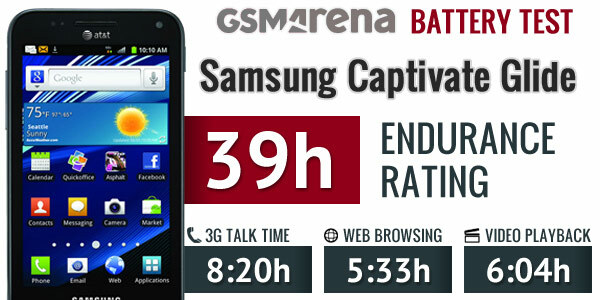 The 1650mAh battery of the device is the same as the unit used in the Samsung I9100 Galaxy S II. The Captivate Glide came out of our battery test with a score of 39 hours. This means that you will have to charge your device every 39 hours if you use it for an hour each of phone calls, web browsing, and video playback every day. You can get the full scoop on the battery test of the Samsung Captivate Glide here. We found the Captivate Glide very easy to handle. The plastic on its back has a nice texture to it, therefore preventing accidental drops. The 4” screen is on the lower end of the size charts these days – it allows you to easily operate the phone with one hand. 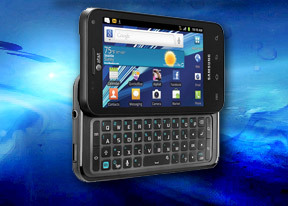 Overall, we found nothing to frown about as far as design and build quality of the Samsung Captivate Glide go. The company has stuck with the familiar formula which has worked pretty well for it in the past. We are now going to take a look at the software department of the device. Don’t be surprised if things look familiar here are well.